Nowadays, it's rare to watch a movie that feels like it was expressly designed for the big screen. Oh, sure, some filmmakers know how to fill up the space with a constant blur of motion and movement and people and things and explosions. Far fewer, however, are sufficiently bold to compose images that take full advantage of the wide-screen experience. Albert Hughes is known for his work with his brother Allen Hughes. Together they made Menace II Society and Dead Presidents, crime films that were bursting with energy, as well as From Hell, an unusual period horror mystery that stands out in my memory more for its florid atmosphere than anything else. The Book of Eli is the clearest antecedent here; it followed Denzel Washington across a barren desert landscape in a survival tale that was marked by its restraint and a vivid sense of desperation and stark beauty. 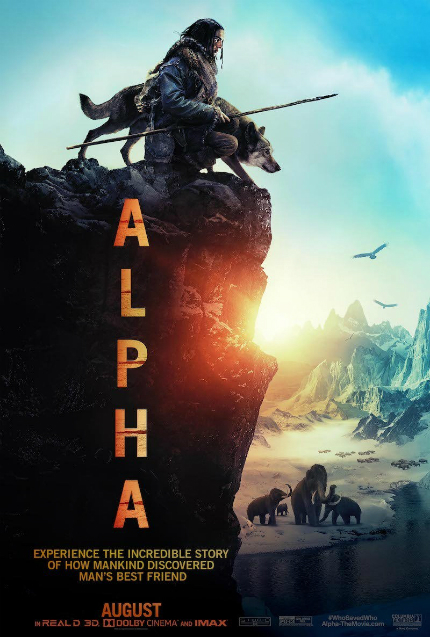 Alpha almost feels like an answer film; it's another tale of survival, only it's set in Europe 20,000 years ago. Whereas The Book of Eli looked like a brutal summer, Alpha favors the darker side of the color palette. The desperation is even more present. Presented entirely in a foreign language, albeit with the compromise of English-language subtitles, the film is told almost entirely through its visuals. Early on, Keda (Kodi Smit-McPhee) is shown to be a young man who may not have the right stuff to survive on his own. His father Tau (Jóhannes Haukur Jóhannesson) is the unquestioned leader of their prehistoric tribe and he makes the decision that it is time for Keda to prove himself, both as a man and as his son. His mother (Natassia Malthe) wonders whether he is ready yet for the hunting season, but off he goes and it is not pretty. When Keda is separated from the tribe and presumed dead, he is left to his own devices to survive the harsh conditions and make his way home. He is not completely bereft of survival instincts; he knows what he must do in order to eat, for example. He is also completely aware of the dangers that surround him and has a fierce desire to live, which always propels him forward. Yet he also exudes a clear sense of kindness and concern for his fellow creatures, and has difficulty with the concept of killing, even if it means his own survival, much less the tribe at large. Obviously, that becomes an issue in a society that is built on self-preservation. But it also leads him to a relationship with a wolf-dog that becomes key to his survival. As he's previously demonstrated in The Road, Let Me In, and Slow West, Kodi Smit-McPhee is more than capable at expressing his emotions without the need to spout off dialogue. His face has a soulful expression that conveys what we must know, while also suggesting any inner turmoil that he is experiencing. Daniele Sebastian Wiedenhaupt wrote the screenplay, based on Albert Hughes' story, and it's a sturdy structure upon which Hughes builds a picture that is often a thing of beauty. Cinematographer Martin Gschlacht shot Goodnight Mommy, which complemented the harsh story with harshly oppressive colors; Alpha is a more gentle movie, but the colors here also complement the storytelling. This is not, overall, a "realistic" film; instead, it's a dream of a distant past that is infused with an overarching need to survive. And it's a must-see on the big screen. The film is now playing in theaters throughout North America. ALPHA Trailer: Watch Out For That Cliff!